The Voice of Local Farmers. The San Diego County Farm Bureau is a non-profit organization supported solely by more than 2,000 dues-paying members. There are 53 county Farm Bureaus in California. Established in 1914, the San Diego County Farm Bureau serves the needs of the San Diego agriculture community. 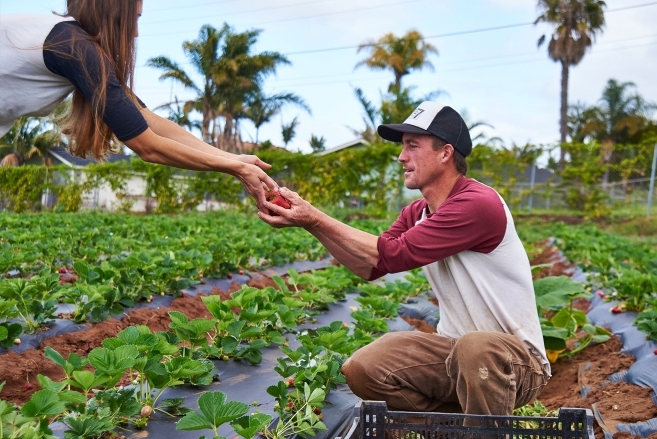 The mission of the San Diego County Farm Bureau is to foster San Diego agriculture through education, public relations, and public policy advocacy in order to promote the economic viability, sustainability, and community building of agriculture. San Diego County Farm Bureau is the leading advocate for the farm community and works with elected officials, government agencies, educators, the public, and the media. Local membership reaches well beyond the boundaries of the county. San Diego County Farm Bureau exists for the purpose of serving the needs of the farm community with informed, timely information and services. Secondarily it helps the members of the community appreciate the value farming brings to the region. San Diego County Farm Bureau is the best association for San Diego farmers because we educate growers and the public about our fast-evolving industry, communicate the value of local agriculture, and represent farming business and regulatory needs. Members take great pride in belonging to the Farm Bureau. 5,732 farms within San Diego County are working to turn a profit. Full-time, part-time, large, small, conventional, organic, urban, rural, established or just starting out. Ranking 12th in the nation, San Diego boasts top crops in nursery, flowers, avocados, tomatoes, citrus, chicken, eggs, mushrooms, succulents, and strawberries. 68% of San Diego County farms are 1-9 acres and nearly 19% are operated by women. San Diego County has more certified organic growers than any other county in the nation with more than 400 certified organic farms and San Diego County is home to 44 certified Farmers Markets throughout the county. Value: $1.8 billion farm gate value, $2.88 billion county economic value. San Diego agriculture is the 4th largest industry in the county. We offer farm-related classes on everything from Fieldworker Training to Water Usage to Labor Law and AgroTourism. We team up through task forces to solve problems like Asian Citrus and LBAM. We provide group options like the Irrigated Lands Group when it is challenging and expensive to go it alone. And we can point you in the right direction when you don’t know where to start. We provide forums for learning and networking, and we work to create a strong positive agricultural community. We publish farming news via our magazine, newspaper, email, social media, and website. We pro-actively seek out media opportunities and speaking engagements to share local agricultural news and successes with our community. We plan farm tours, an industry expo, and work with the San Diego Fair to spread the good ag word. We host meetings that bring stakeholders together. We demonstrate the value of agriculture and the value of working together for the common good. We speak on the collective behalf of the farming community. We nurture our connections to open doors for our farming members. We advocate county and state-wide for rules and regulations that keep farmers in business. We mitigate issues that are impediments to farming success. We leverage our comprehensive farming business knowledge to create new opportunities for farmers. We monitor every level of government so our farmers can farm.